Saul Kaiserman (skaiserman@emanuelnyc.org) is Director of Lifelong Learning at Congregation Emanu-El of the City of New York. As Reform Jews, we cherish our autonomy while simultaneously valuing our link to the Jewish historical arc. This can generate tension, especially in the area of worship. Prayer must be intensely personal, yet in communal worship we often use words passed on by tradition. 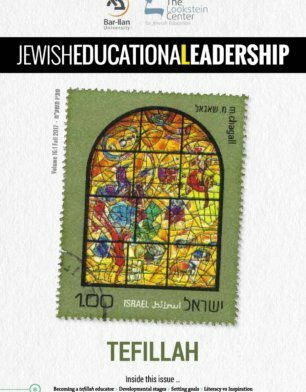 In our religious school at Congregation Emanu-El of the City of New York, tefillah comprises as much as 25 percent of school time. 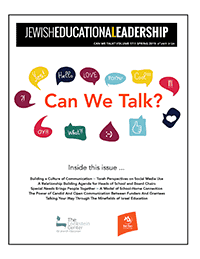 Students learn both the skills to pray as part of a Jewish community as well as engage in a rich dialogue that helps them to find personal meaning in the words they say. The experience is transforming how our students see themselves, as they become equipped to grapple with their personal relationships with the Divine amidst a congregation of diverse individuals. Our youngest students learn to associate the melodies with the Hebrew texts even before they can read the letters. As they grow they learn shorter prayers with catchy melodies that repeat the words again and again and longer prayers line by line. From grades three to five, the melodies used for each prayer are mostly consistent, enabling students to develop a sense of routine and familiarity. Prayers are kept in a loose-leaf siddur which grows with them as their tefillah repertoire increases. As students learn the prayers they explore questions designed to help them think deeply about the words they are saying, such as: “what’s so great about having one God?” or “if we’ve been praying for peace for so many years, why is there still war?” Students initially grapple with these questions in hevruta before discussing it in a larger group. After anywhere from a few weeks to several months unpacking the different ideas contained within a prayer, they work in the school’s art room to create an original design for the page in their prayer books. The Hebrew text gets surrounded by their own images, words, and symbols, so that every time they look at the page, they will have personal reminders of what the words mean to them. As our students approach adolescence and the responsibilities associated with becoming a bar or bat mitzvah, they are charged to lead prayer services they find personally meaningful. In the first half of the year they participate in the Emanu-El daily Sunset service using the Union Prayer Book, read Jewish and Israeli poetry aloud in English, and engage in silent meditative reflection with no prayer book at all. They learn to compare those prayers with other prayer services they have attended and to take note of which aesthetic choices resonate with them. By answering questions like, “What did and didn’t work for you in this service?” the students learn to articulate for themselves which elements of a service most enable them to have an inspirational and uplifting prayer experience, as they learn to recognize and appreciate many different styles of worship. In the second half of the year they work in small groups to plan a worship service for their peers. Students make use of all the skills learned in previous years as well as their own talents and creativity. They have the latitude to introduce music and art, choose the venue (in the sanctuary of the roof), the pose (seated in pews, chairs or on the floor), and more as they work together to make the service engaging and meaningful. At the same time, they come to understand that they may sometimes need to compromise their own personal and aesthetic preferences in order to participate as part of a community. Ultimately, parents are invited and rarely miss the opportunity to sit with pride, watching their children lead their peers in prayer. In the ten years since we pioneered this model at Temple Emanu-El, ten other congregations have adapted the curriculum to their settings. Each school varies the specific methods they employ to suit their needs, for example, by joining together multiple grades in a cyclical rather than sequential curriculum. What all of us have in common is an approach that prioritizes close examination of the words of the Hebrew text and robust discussion of the students’ interpretations of those words. We are gradually building a network of synagogues engaging as a community of practice, with a Facebook group, a wiki, and a bi-annual face-to-face day of sharing and collaboration. A video describing the program is on-line at www.emanuelnyc.org/tefilah.